APMS 6th Class Results Marks, score card, School Wise, District Wise merit list download- AP Model School Result 2019 School Wise Selected list Certificate Verification Dates, admission counselling MODEL SCHOOL VI CLASS ADMISSION TEST 2019 MERIT LIST. AP Model School Selection list 6th Class Admission 2019 | APMS 6th Entrance test Merit list, Results AP Model School entance test VI Class Entrance Test 2019 / APMS CET 2019 Notification released to give admissions in Andhra pradesh model schools across the state by the commissioner and school education department Andhra Pradesh in the month of January 2019 for the academic year 2019-2020. APMS officials invited the online applications are accepted from eligible students to get admission in class VI from 10-01-2019 to 21-02-2019 through APONLINE Web portal /CSE AP Webportal from the eligible 5th class passed/ studying students . A great craze now araised in model school admissions for quality education system. Due to this a large number of students applied for this exam and they were appeared the model school VI Class Admission Test 2019 exam on 31-03-2019 at ap model schools across the state at each mandal head quarters or model schools in all districts of AP State . The APMS Officials has successfully organised the APMS Class 6th exam on 31st march 2019. APMS Answer key also released Now the students are awaiting for results. On the basis of scored marks got by students the APMS Merit list will be prepared and then selction list will be announced on 15-04-2019 as per reservation for admissions criteria. AP Model scchools results, marks, merit list , selection list will be released by AP Model School institution official website @ apms.apcfss.in. APModel Schools 6th /7th/8th/ 9th/10th classes Admission/Entrance Test 2019 Results/ APMCET 2019 Results, selected candidates list 2019, Certificates Verification Dates, Admission counselling dates details are given here. Eligible students who applied for this entrance test and they were appeared the AP Model School 2019 and they are waiting for their Results. Candidates can download their Merit List /selected candidates lit from the given from http://cse.ap.gov.in/DSE/ . APMS Official will publish of Merit list for admissions into TS Model Schools. Now, appeared candidates are waiting for their results. DSE officials is going to start the evaluation process of entrance exam papers after they will send or upload the merit list or results of APMS Entrance Test 2019 on its web portal after completion of process of answer script evaluation. After, they should publish or place the merit list on web portal. So, candidates can check their results from here. Online payment of the registration fee for admission through AP Online, online submission. 4. Merit List/Selection will be downloaded. 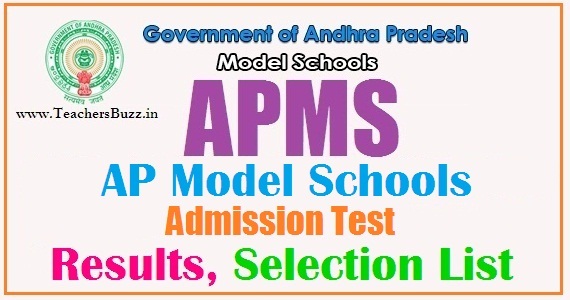 AP Model Schools VI Class Admission Test School wise Result, Merit List 2019, Ananthapur APMS 6th class Entrance Test Merit list, Results 2019, Chittoor APMS 6th class Entrance Test Merit list, Results 2019, East Godavari APMS 6th class Entrance Test Merit list, Results 2019, West Godavari APMS 6th class Entrance Test Merit list, Results 2019, Guntur APMS 6th class Entrance Test Merit list, Results 2019, Krishna APMS 6th class Entrance Test Merit list, Results 2019, Kurnool APMS 6th class Entrance Test Merit list, Results 2019, Kadapa APMS 6th class Entrance Test Merit list, Results 2019, Nellore APMS 6th class Entrance Test Merit list, Results 2019, Prakasam APMS 6th class Entrance Test Merit list, Results 2019, Srikakulam APMS 6th class Entrance Test Merit list, Results 2019, Visakhapatnam APMS 6th class Entrance Test Merit list, Results 2019, Vizianagaram APMS 6th class Entrance Test Merit list, Results 2019, AP Model School 6th Class Entrance Exam Results Download, APMS CET Web Portal: https://apms.apcfss.in/ AP Model School Result 2019, AP Model School Selection list for School Wise, District Wise merit list download- APMS School Wise Selected list at apms.apcfss.in.